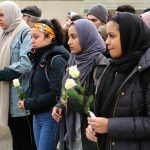 A crowd of people gathered in the quad March 18 to mourn and pay tribute to victims killed at two Christchurch mosques last week, a shooting now known as New Zealand’s deadliest in modern history. 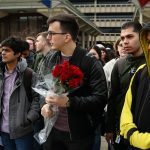 Those in attendance at the vigil, organized by UIC’s Centers for Cultural Understanding and Social Change, offered flowers, prayers, and a pledge for renewed or continued activism — their expression of solidarity with Muslims and other groups who have faced any hate or tragedy. 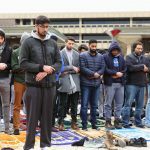 “We are here to collectively grieve, and to affirm the faces and lives of people like 3-year-old Samali Mucad Ibrahim, 71-year-old Haji-Daoud Nabi, a 20-year-old son, Talha [Rashid], and many, many more,” said Nadine Naber, the founding director of the UIC Arab American Cultural Center. 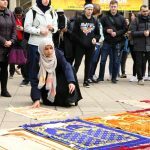 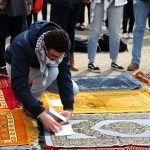 Prayer rugs lay in the quad for the 50 people who died: innocent men, women, and children who were simply engaging in an afternoon of prayer before the suspect of the massacre posted hate-filled statements online and broadcasted live video of his first mosque attack on social media. 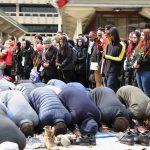 He then moved on to another mosque 3 miles away, where his second rampage on worshippers took place. 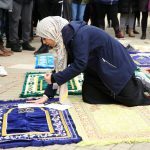 But Naber’s words extended beyond the New Zealand attack, touching everything from borders to the militarization of police forces. 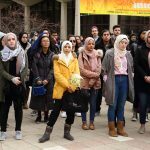 After, Nesreen Hasan, assistant director of the Arab American Cultural Center, reminded students about the center’s resources and purpose to serve as a safe space on campus. 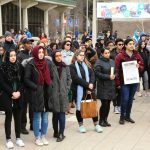 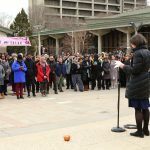 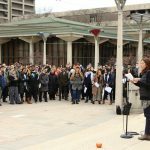 All other speakers — students from the UIC Muslim Student Association; Amalia Pallares, associate vice chancellor and vice provost for diversity; and Provost and Vice Chancellor for Academic Affairs Susan Poser — shared messages of support and unity.